Indulge in our premium collection of filled dates, grown using time-honoured farming methods which create intense, mouth-watering flavour. Each of our filled dates have been crafted using the finest ingredients and they come with unique flavour profiles you won’t find anywhere else. Why not try our luxurious Medjool dates, filled with premium pistachios for a deliciously nutty crunch? Or enjoy Bateel’s irresistible Khidri dates with mouth-watering caramelised pecans. Whichever types of dates you typically prefer, you can be sure we have something to satisfy your taste buds. 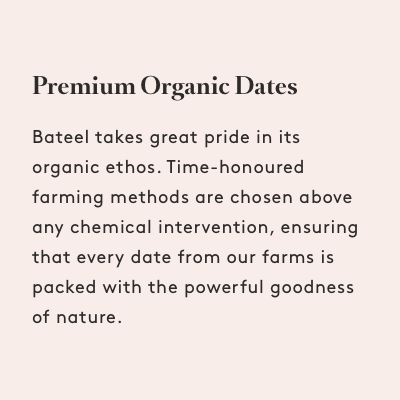 As they are organically grown, you’ll also find our satisfying dates are full of essential nutrients. So, not only are they delicious, but they’re good for you too. Don’t forget, you can add any of our premium filled dates to one of our beautiful wooden gift boxes. Available in a variety of designs, you can choose from small, through to extra large boxes, packed full of tasty Bateel filled dates. They would make a fantastic gift for any date connoisseur.